Earlier this month, a patent from Dell revealed that the PC maker is also planning to launch a dual-screen device. Today, we discovered a new patent by Dell which explains how the device would adjust its form factor and appearance of the operating system in different conditions. First spotted by us, the patent titled ‘Configuring multiple displays of a computing device to have a similar perceived appearance’ was filed by Dell in November 2017 and published by USPTO on February 12, 2019. Dell says that the invention described in the patent application is for a computing device with two displays connected together using a hinge. The dual-screen device provides a perceived appearance (e.g., in terms of colour balance) among multiple display devices of the device. In the patent application, Dell explains that the operating system, which will power the device, will enable it to be configured as a single extended display device. For instance, when the device is in extended display mode (unfolded form factor), the content (application, movie, video) will be displayed on both of the devices at the same time. Dell is aware of the problems that a dual-screen device could experience. For example, the content when displayed on both of the devices may appear disjointed if the perceived colours displayed by one display device differs from the perceived colours displayed by at least one of the other display devices. 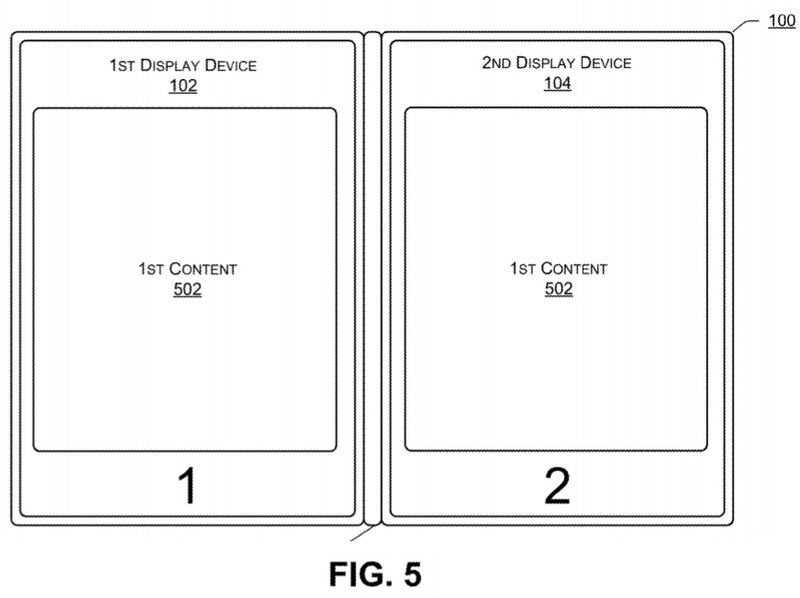 The patent filed by Dell details various methods to address the dual-screen device problems. “In some examples, a computing device includes a first display device coupled to a second display device by hinges. After determining that the computing device has been moved from a first orientation to a second orientation, the computing device may receive ambient light data from ambient light sensors associated with the first and second display device, temperature data from temperature sensors associated with the first and second display device, and color data from color sensors associated with the first and second display device. After determining that power is being received from an external power source or that the user prefers the display devices may be color matched, the computing device may perform one or more color adjustments based on the ambient light data, the temperature data, and the color data, thereby reducing a difference in a perceived color between the first display device and the second display device,” Dell explains.